I don’t know about your neck of the woods, but here in New York, the magnolia trees and forsythia are in full force, baseball has taken over my 1010 WINS sports report, and the market is slowly but surely becoming more plentiful in the asparagus department. In honor of that, I thought you might like a pizza recipe that takes advantage of all this. (Remember, Golden Rule Number 348: When in Doubt with Kids, Pizza.) I developed this asparagus-mint-feta pizza for a new partner, King Arthur Flour, and the best thing about the recipe is that the crust is made with their white whole wheat — which is lighter in color (i.e. good for kids who balk at a darker grains) and nutritionally identical to whole wheat flour. OK I lied, the real best thing about it is that they’ve offered DALS readers a pretty amazing giveaway — everything you’re looking at in this photo below PLUS (not shown) an Emile Henry pizza stone! Guys, I don’t know a lot, but I do know that this is mighty generous of them. Comment below to be eligible. (It wouldn’t hurt if you included a pizza tip or trick.) Deadline: Tuesday, April 5 at noon ET. Good luck! One bag of their Identity-Preserved White Whole Wheat Flour (“Identity Preserved” means the grains are sustainably grown and traceable from field to flour); one bag of their signature All-Purpose Flour; a “bake” mug; dish towel; dough scraper; bench knife; and the sweetest vintage tea towels. Comment below to be eligible to win. Contest ends Tuesday April 5 at noon ET. Good luck and thanks for playing! UDPATE: THE WINNER HAS BEEN NOTIFIED. THANK YOU TO EVERYONE WHO ENTERED! Preheat the oven to 475°F. Using your fingers or a pastry brush, grease a 17 x 12-inch rimmed baking sheet with 1 tablespoon of the oil. Drop pizza dough into the center of the baking sheet and, using your fingers, press out and flatten the dough so it spreads as close as possible to all four corners. (This takes time, but you want it to be thin so it cooks evenly and quickly.) Sprinkle with the feta, leaving a ½-inch border around the perimeter. In a large bowl, toss the asparagus, leeks, lemon zest, and garlic powder. Season with pepper to taste and drizzle in the remaining 3 tablespoons olive oil, then give it all another toss. Using your hands, add the asparagus mixture on top of the cheese in an even layer. Brush the exposed edge of the crust with a little oil. Bake for 15 minutes, until the crust looks golden and the asparagus looks crispy and dark brown, but not black-burnt. (You can always cover the toppings with foil if the asparagus looks ready before the crust is.) Remove the pizza to a cutting board to cool. Top with herbs. Slice into eight rectangular pieces and serve. In a medium bowl, stir together the flour, yeast, salt, and sugar. Add the water, and using a wooden spoon or your hand, mix until blended, at least 30 seconds. The dough will be stiff, not wet and sticky. Cover the bowl and let it sit at room temperature until the dough has more than doubled in volume, about 2 hours. Divide the dough in two and shape each section into a flattened ball. If you are only making one pizza, freeze the other ball in a freezer storage bag. If you rub a little olive oil on your fingers and on the ball of dough before bagging, it will be less sticky to negotiate. I love making pizza with my son. We have so much! King Arthur flour is the best! If you’re in Vermont make sure to visit. Pizza tip: make deep dish Chicago style pizza in a cast iron skillet. This is terrible said no one ever. I LOVE King Arthur! One of the many reasons I miss living in Vermont. And my kids love pizza (no surprise there). My favorite pizza trick is to sprinkle whole wheat flour on the pan before putting the dough on. It’s not as obvious as cornmeal, but just as helpful in preventing sticking. I love pizza!!! Asparagus and feta sounds amazing. Preheat your banking stone in a very hot oven for an hour. Guaranteed crispy crust every time! Plus pizza only takes 10 min to bake. I would love to win. Pizza is my spirit animal. I love adding all sorts of veggies to it. mozzarella, Calabrian chili, basil, Parmesan (I substitute Pecorino). Delish. Put a tiny bit of balsamic vinegar on arugula and toss it on the finished pizza. Hungry just seeing your recipe! I just happen to be making pizza for dinner tonight. I am trying a new shrimp scampi variation and I am now wishing that I had some asparagus on hand as I think that would have really gone well with the other ingredients. One of our favourite pizzas that I make (tomatoes, kalamata olives, and artichoke hearts on a garlic olive oil base) has feta on it and I really like the briny salty taste it adds. Thanks for yet another pizza variation for us to try on another evening. This makes me want to make an asparagus and goatcheese pizza but then not because no wine really goes with that (and if I can have wine with pizza I do…). Eh, who cares, I’ll still do it! This makes me want to make an asparagus and goat cheese pizza but then not because no wine really goes with that (and if I can have wine with pizza I do…). Eh, who cares, I’ll still do it! I love putting potato on my pizza–slice it thin to get it nice and crispy! This looks great although I would need to use the second ball of dough to make a plain cheese one for my picky eater. Love their flour for pizza! YUM! I’m not sure if it would go on the pizza, but a little bit of walnut pesto is my favorite thing to add to asparagus! I LOVE baking and would love to get into the pizza dough game! Pizza loaded tasty homemade marinara sauce, mozzarella and fresh veggies has been a go to favorite meal for my 20 month old daughter. We would to win this awesome prize package? That pizza has Spring written all over it. The King Arthur website is worth mentioning. Tons of information, recipes and the products are top notch. You have two different contest deadlines. Is some kind of April Foolery going on?? What a fun way to welcome spring. I’m always looking for ways to liven up a wholegrain pizza crust. My daughter is figuratively made of pizza. King Arthur website is one of my faves. Whole wheat waffles were one of the first recipes my daughter ( now 12) and I “made from scratch” . They are now a weekend staple for her to put together. No pizza stone in our house (yet) . Hope! Hope! Pizza tip? FRESH GROUND PEPPER. Works on nearly every pizza I’ve had and turns a kid friendly pizza into an adult pleaser. Pizza is our Saturday night dinner staple. I’ll have to try this recipe! Oh this looks awesome!!!!! Spring pizza sounds amazing right about now! Garlic butter and kosher salt on the crust! I’m not a kid but pizza is my favorite food ever! we are definitely having pizza for dinner tonight! Thin crust pizza for the win! My pizza tip is always cook in a cast iron skillet! We have DIY pizza night every Friday. So normally anything with yeast is a deal breaker for this overworked, underappreciated working mother – but if I had a pizza stone maybe I’d be more inspired. I love the site and your books – hearing relate-able stories of finding time for dinner with the family in a judgement free space keeps me coming back for EVERY new post! How perfect- pizza night here as well! No special tricks I’ve figured out yet, but our best topping so far is roasted delicata, sauteed kale, caramelized onions and goat cheese- so, so good! This pizz looks wonderful – I’m hungry just looking at it! The ONLY flour I use is KA, and for my homemade pizza dough I use a combo of their Bread Flour and White Whole Wheat. Comes out amazing! Our new favorite pizza is as follows….Pesto base, followed by sliced (cooked beets), sliced red onion, banana peppers, chopped, and a combo of blue and mozzarella cheeses. TO DIE FOR. Yum. That pizza looks delicious… Yum! My tip is to scatter cornmeal on the pizza pan instead of using oil; the pizza releases so well this way. This looks awesome! I love King Arthur. My favorite pizza joint serves a classic margherita pie with an arugula salad on top. That’s my favorite way to make it at home, too. Pizza is a family favorite! I make two: one tomato sauce/mozzarella for the picky eaters, the other with more variety for the adventuresome (spinach and feta; peach, prosciutto, goat cheese). I make homemade dough in my bread maker and always use half white whole wheat flour to up the nutrition. What a great giveaway! The pizza looks delicious too! What a great recipe! I’ve been wanting to try to make my own pizza dough, so this is great motivation to start. I really haven’t mastered homemade pizza. I’ve tried so many recipes, but I’m never really satisfied. But I love pizza and I will keep trying until I find one that really does suffice! I love grating parmesan over my pizzas both before and right after they come out of the oven. After seeing this I need to make one this weekend! This pizza looks like just the thing for spring. And I’ve got most of the ingredients already! I usually combine my white and wheat flour at 3/2 for the no-knead dough recipe I use. This would save a step! I’ve never been terribly successful with homemade pizza, but I feel like with all these tools I couldn’t help but make something restaurant-worthy! This looks amazing and I am going to revise my weekend meal planning to include it — gorgeous! Love this recipe and giveaway! My pizza trick is actually for the dough, instead of granulated sugar I like to substitute honey or maple syrup to complement the toppings. Think honey with fig and prosciutto. We like to put garlic and fresh herbs in the dough. I’ve been seized with the urge to put mint and feta on everything lately. What a wonderful-looking goodie bag! Hot Sopressata, chiles & honey drizzled pizza….the best! Mmmm, pizza! I use your pizza pages from your first book ALL THE TIME, and we all love the homemade pizza! My kids love ‘breakfast pizza’ with egg/cheese/bacon or sausage. A little time-consuming, but a popular weekend breakfast at our house. Jenny, I love your site and your book! You gave me the energy and inspiration to get back in the kitchen and make dinner (almost) every night, which had become frustrating and exhausting with a toddler and busy jobs with unpredictable schedules. So, thank you! I now keep a double batch of pizza dough in the freezer-and can even get said toddler to eat a vegetable if I shred zucchini and hide it under the cheese! We have pizza at least once a week and love using King Arthur Flour for the dough in our bread machine. Turns out perfect every time! Make a few batches of dough, put them in individual bags, and freeze. Makes for a super easy, quick, and delicious family dinner. I love making homemade pizza so I would love to win this! Asparagus pizza- with mint? This screams SPRING (and it sounds delicious)! Had not heard of “identity preserved” before- great! Our favorite homemade pizza is sautéed mushrooms with fresh thyme with a white sauce. There is truly nothing better than making pizza from scratch. The freshness and the love shine through each and every time. Actually there is something better, and that is having the awesome kitchen tools to execute your homemade pizza recipes to perfection. I read only two food blogs: yours and the KAF blog! How awesome is this combo going to be?? Darn. Forgot about Smitten Kitchen. Three food blogs. yum! This would be such a nice prize! I love and only use KA flours. When I make pizza on a stone, I bake the dough for 3-4 minutes on one side, remove from the over and flip the pizza over, then add toppings. Makes a nice flat top. Baking posts to the DALs lineup? I always heat up the pizza stone for at least 30 minutes at five hundred degrees so that the stone is non-stick and the crust cooks correctly. Make sure you start the stone in a cold oven so that the stone doesn’t crack. Second, I always make a double batch of pizza dough, so that I can save one in fridge or freezer for later. The dough from the fridge is always easier to work with! Finally I always sprinkle the hot stone with cornmeal for crunch. I want to win! In spite of the fact that the last time I tried to make pizza, I overworked the (TJ’s) pizza dough and we ended up eating the toppings by themselves. I clearly need some practice! I think I have to change my dinner plans for tonight. Pizza it is! I’ve never tried asparagus on pizza before! I absolutely love making homemade pizza with King Arthur Flour. And the best tip I can offer is to preheat the stone to get a crunchier crust if that’s what you’re after. Well that and to not be afraid of adding some spices to the dough. We love to add garlic and oregano to our dough for a more flavorful one if we are doing a plain cheese pizza. I make pizza every friday! I’m looking for new toppings, and asparagus sounds great. Unfortunately, my 4 year old son doesn’t like pizza (yet), but he does like cheesy bread. This looks so good!!! I just got back from the grocery store and bought asparagus so this is what we are going to have for dinner tonight!!! YUM!!! I love making pizza at home too! Your pizza dough and sauce recipe from DALS is my go-to for homemade pie. The white pizza with arugula, parm, lemon, and ricotta is my personal favorite, although my husband prefers pepperoni. I’ve made the dough with all whole wheat flour and with 50% whole wheat and 50% all purpose. The whole wheat version is a bit denser, but still delicious. My girls love making pizza! Their go-to toppings are black olives and mushrooms, but they have recently started adding bacon to the mix. No complaining here! For something so straightforward, pizza dough is always more challenging for me than I expect. I could use an excuse for more practice! My favorite pizza tip – prosciutto and arugula fat read from Dals. Just had it Monday night for dinner. I wish I had a pizza tip to give. But I’ve never made dough before. I’d love to be able to try and give it a shot though!! Favorite pizza toppings: olive oil base, mozzarella, leeks and bacon. The pizza and giveaway look amazing! Pizza is the perfect food. We love pizza fridays when the kids get to put together their own pizza. Can’t wait to make mine with some lemon zest added on. My pizza tip is to let the kids make their own. My middle-school-age son is always in the kitchen with me when it’s pizza night It’s great when they have friends over, to get them off their screens and into the kitchen. Love to see the partnership with King Arthur flour. Their catalogs are always a highlight in my pile of mail. Pizza tip: mix freshly shredded Parmigiano-Reggiano into the dough! I’m making pepperoni, chili, and honey pizza for some friends tonight. I don’t have a pizza stone, so I flip my pans upside down and heat them in the oven first. I love King Arthur Whole Wheat Flour! I also an asparagus fan….. I love the white whole wheat flour- my go-to. We love making pizza at home! Tip: Pick up a copy of Flour Water Salt Yeast by Ken Forkish. It turned my husband into a pizza god :). Pizza is never a bad choice! The only thing better than homemade pizza is healthier homemade pizza! My husband made us pizza last night and the crust was Greek Yogurt, King Arthur White Whole Wheat Flour, baking soda, and salt. It turned out really good! What a great giveaway. I have to try the King Arthur flour for pizza. A guest brought a King Arthur scone recipe to my Easter brunch and they were fantastic! Yum! With asparagus season right now, I’ve been trying to use it on/in everything! My favorite pizza trick is to make dough with honey! My tip is to always use your pizza dough recipe from your first book! Works like a charm every single time! We have had homemade pizza party every Friday night since 1997! We always use King Arthur flours to make the dough. What a great pizza package! Pizza is a staple at our house. We always use our super peel to transfer the pizza to the stone in the oven and it’s helped even us novices to make amazing crust at home! I’m a big fan of slow-rise pizza doughs. Cut the yeast a bit and let it rise all day while you’re at work. I actually have pizza dough on the counter right now! I love making pizza from whatever I have in the fridge – a delicious way to use up those extra bits. LOVE pizza! Especially my husbands clam prosciutto pizza! Pizza tip: kale as pizza topper. Prep a cheese pizza and then add a big pile of kale torn to bits and massaged until more or less evenly coated with olive oil. Almost like kale chips on pizza! We used to make homemade pizza when I was a kid as a treat, and though I love a good parlor pizza, that homemade stuff on my mom’s old cookie sheets will always taste like home. King Arthur flour is the BEST. When we lived in MD, I had the chance to visit their headquarters….lots of fun. King Arthur is my go-to! Love New England products. There are 2 deadlines in the post! Hope I’m in time for at least one of them. We add craisins to our pizzas. That bit of sweet in with all the savory is my favorite part. Please consider me for this prize. I love to make my pizza on the barbecue. Just have to have the toppings ready ahead of time. Cook the dough on one side on the grill, flip it and then throw the toppings on fast, pull the lid down and it comes out amazing! Yum!! I have a spinach and feta frozen pizza in the oven as I type this – I would love to up my Friday Night Pizza game! My two year old’s favorite food is pizza. Hands down. She loves to throw flour everywhere when we make crust, and wouldn’t you know it, I can get her to eat things she normally would not, if I put it on pizza. Gotta love kids. Am I too late? Pizza is a staple at our house, we throw on whatever leftovers we happen to have. This would be fun. While an avid and adventurous cook, bread and yeast still scare me a bit. I’d definitely give it a try. When we make pizza at home, we make personal pizza, and I let my daughter pick out her toppings and put them in herself. Everybody is happy. Thank you for the opportunity! My kids love a little (or a lot of) BBQ sauce mixed with the traditional pizza sauce. We make the dough in the food processor! Love pizza when the warm weather comes around. I always try to keep it simple, cheese, sauce, and whatever is laying in the fridge. Friday nights are always pizza night at our house! I am making this recipe tonight! No pizza tips, just yum! I would never have thought of asparagus on pizza! Can’t wait to try it. What an awesome giveaway! We love making pizza at home, and our newest “trick” is to brush the crust with olive oil and then sprinkle with sea salt just after the pizza comes out of the oven. love love love asparagus on pizza. no matter what kind of pizza i’m making, i cover it in asparagus before tossing it in the oven! Our sweet daughter has claimed homemade pizza as a favorite food and we love topping the pizza with her. She eats as many toppings as she puts on but when the toppings are olives, artichoke hearts, tomatoes, and thoughtfully raised & made salami, who can argue? We love heavy-on-the-garlic. Yours looks wonderful! My pizza tip: Use a scale! I had a $5 tea scale sitting around and used it to measure pizza dough ingredients once… never looked back. Crust turned out perfectly. I believe the recipe I used was from Serious Eats! Pizza!!! yum! !1 My most favourite food of all!!! This looks amazing! I have been making Jim Lahey’s pizza on a sheet pan for a few years and it is amazing, but I want and need a new variation. This dough looks like it. And I always use King Arthur flour! I love King Arthur flour, have used it for years, and I often special order chocolate chips from their website – they have mini-chips that at least claim to be made in a fair-trade fashion. This pizza idea is very similar to one that we use ALL. THE. TIME. My husband invented a recipe he calls “Spinach Feta Pizza”. We’ve had it so many times that the kiddos don’t balk at all – in fact, they love it and cheer whenever they hear that’s what’s for dinner. My husband is still MUCH better than I am at making the dough, but I do a good enough job when its my turn. Thanks for the idea to use if for asparagus! What a great giveaway! Any pizza is made better by grilling the dough! A pizza stone works wonders! I love to let the kids put their own toppings on. My tip is teach the kids to make the pizza themselves! This would make it much easier for them to do it! I hope we win! I make pizza about once a week. I like to get creative and try to use up leftovers or things I have in my fridge that have been hanging out for a little while. My daughter also loves to help me roll out the dough. My 8 month old also loves gnawing on pizza crusts. It’s a frequent dinner in our house! My pizza tip is to reheat your leftover pizza slice in a skillet (not the microwave)! Don Pepinos for the sauce. There is no other choice. Even bad pizza is good. Have not made pizza too much at home, but would love to change that. Last time I preheaed pizza pan and slipped small pizzas on parchment onto it, turned out pretty good. Pizza is finally on our regular menu after our picky & allergy kiddo decided it was delicious. That would be a fun gift to checkout with the new pizza lover in the family. We love family pizza night. Ever since my boys could reach the counter by standing on a chair they have picked their own toppings and customized the crucial sauce to cheese ratio. Now at ages 7 and 9 I think they are ready to take on making the dough. If we win this kit we will put it to good use teaching boys to become self sufficient in the kitchen! my dad started me to be interested in King Arthur Flour. would travel 20 miles to get King Arthur Flour for his Christmas cookies. now that’s what I buy too. Sounds great! Thanks for the tip and the giveaway. We love to have pizza and movie nights with our kids and are always looking at ways to make it healthier. Pizza is the best! DIY is so much better then the pizza shop! My kids love spinach, tomatoes, goat cheese and parm. Great for Friday night! Let’s not forget “dessert pizza”……can anyone say crust, Nutella, bananas, strawberries??? BUT the possibilities are endless! I’ve never used a pizza stone but would be excited to try one! Thanks! We used to live just down the road from King Arthur flour–I miss it so much! We’d love to win since our old pizza stone had an unfortunate accident a few months ago and has not recovered. Love home-made pizza, but I’m a little weird…I don’t love melted mozzarella cheese. But sprinkled feta, that could be delicious! Pizza on the grill is the best….super good and easy clean up! Yum – pizza! My favorite dough recipe is Smitten Kitchen’s lazy all day pizza dough. Mix it up before work and it’s ready to go at dinner time. I should try it with white whole wheat! I’ve never made pizza from scratch, but I’d like to! We just made your sausage and ricotta pizza last night. This will be next up! Leftover pizza is a happy kid food. Bake pizza in the morning or when you can and eat it when you get them home! What a giveaway! Pizza is my clean out-the-fridge meal: everything tastes great crisped up on top of a pizza. Yummy! I’ve been looking into various homemade pizza recipes recently. It feels better to be able to make your own, rather than relying solely on take-out. This looks like a fantastic giveaway. My family makes pizza maybe once a week. We make the dough in the bread machine. Fresh basil is my favorite topping. We love homemade pizza! We bump up the temperature to 500, which helps encourage char on the edges….great giveaway! I love KAF!!! Grew up near there … what an amazing company. Have been loving prosciutto, fig, cheese, arugula as a topping. Friday night is pizza night in our household, but I’m chagrined to say it’s usually order in. This is a great reminder that homemade is totally doable, especially if you prepare the dough the night before. Thanks, Jenny! Yum! My family of teen boys and tween girl love homemade pizza and asparagus–this recipe will be a winner! I have to avoid gluten, so I will swap out the crust for me; awesomely chewy wheat for them, though, is the only way to go! I love the good ol’, Italian style crispy thin-crust pizza margherita. Nothing can beat it! I love King Arthur’s flours. Waiting for local asparagus to be ready! King Arthur Flour is seriously the best! My pizza tip is put all ingredients on half the dough (rectangular shape that fills a baking sheet) then fold over and cut into stuffed breadstick pizzas! It’s great for lunchboxes and to pack a few to go to sports etc.! I love King Arthur. We have to eat gluten free and live their gf mix was! Saw this about 6 hours too late – we ordered mediocre pizza tonight. Will try making my own next time. I would love this. I love to cook my pizza on the grill- I cook one side, flip it and top it and then cook for about 10 minutes. You can get the grill so much hotter than an oven and the crust is incredible. We love veggie pizza with a lot of onion! Try cooking it on the grill to really taste like Spring. I love homemade pizza and all of its endless possibilities! I sometimes cheat and use naan as pizza base. For Valentine’s Day I cut a couple of naans in heart shapes with kitchen shears and my little kids went nuts! King Arthur is the best for baking at altitude here in Vail, CO! Wow, this pizza looks amazing – and what a great prize pack!! I don’t think I have any new and innovative tips, but I sure could use one on how to get my dough thinner! Pizza is definitely part of the rotation at our house! I usually buy the pre-made dough. Sometimes, I make the sauce, but also Pomi makes a pizza sauce in a tetrapack with a cap. Broccoli is always a good choice for a veggie topping. Oh, that all looks so good! We will add that spring pizza to the rotation immediately. And who doesn’t love King Arthur? I ran out of their flour while making the Irish Soda Breads for St. Patrick’s Day this year and the difference in the quality of the “with King Arthur” and “without” was immediately visible, even to the 4th graders who were the target audience. Thanks! We make pizza probably once a week with our teenagers–it rids the frig of all sorts of miscellaneous “hangers-on” and they feel like they’re getting a treat! The homemade crust is the best part and when it’s a busy sort of day, I’ll cheat and use the breadmaker to prep the dough. Looks delicious! Can’t wait for spring to truly arrive. I’m going to have to get some of that white wheat flour. We’ve ditched regular white from our diet and overall it’s been a success but baking with the darker wheat is tricky with the pizza and bread dough recipes. We make our own pizza at least once a week with TJ’ s dough- can’t wait to try making it with white wheat. We like make a margherita with mozzarella and basil-so good! Farmers Market opening next weekend, I’ll make this! 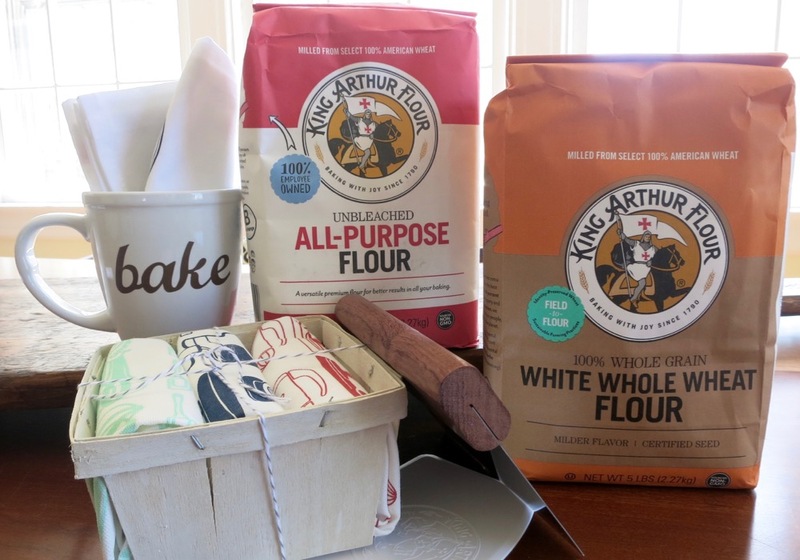 I love king arthur flour – cant wait to try making from scratch. We like to put a little olive oil on the underside of the crust it adds a little crispiness. Also pizza with mozzarella and basil is our fav! Since my husband and I have been married, our family has made pizza every Friday night. Now that two of our four children are in college, it’s so much fun to see them bring friends home and make certain to be here in time for Friday night pizza. When your kids share your family food traditions with their friends, you know you have done something right. I have tweaked my pizza dough recipe over the years, but the most important change I made was switching to King Arthur flour. Good pizza requires good crust and to make a good crust, good flour is essential. Sounds like a perfect spring pizza! Love King Arthur products. And your pizza recipes are my go to. I never knew how much I could love a salad on pizza before your book came into my life! We have just started making our own cast iron pizza – no more takeout for us! “Only Buy KA Flour” has been passed down for 3 generations in my family. Making pizza together is a great family ritual. My children love to put their own spin on toppings – asparagus is one I had not thought of before. Yay, love homemade pizza! We like to start our dough the day prior – let it rise at room temperature for a few hours, then switch to fridge, then back out at room temp a few hours before using. I just tried the Mark Bittman food processor method of making pizza dough when I realized I didn’t have enough time for Lahey’s. Genius. I like to use drained diced tomatoes from a can in place of pizza sauce – quick, easy, and good! Have been wanting to visit King Arthur, but never find myself in that region of the US unfortunately. An excellent pizza dough? The no-knead bread recipe, left to ferment for about 50 hours. Absolutely perfect! Love this recipe. Thanks for sharing! Pizza night is always a good idea. I have had good luck with a cornmeal and flour mix on the stone. Love healthy pizza! We like to customize for everyone by having them create shapes with veggie toppings. Fun = more likely to eat. This recipe looks awesome! I think I’ll substitute goat cheese for the feta, but YUM! Looks great! Pizza For the win! I love pizza, and this looks amazing. Never trust a pizza that is a perfect circle. Is it weird I don’t know whether I’d be more excited for the pizza stone or for finally getting a dough scraper? Love this! My daughter likes to break an egg on to her pizza right before it goes in the oven! We LOVE making pizza at home, and absolutely LOVE King Arthur Flour!! Pre-heating your pizza stone is key to a crispy crust pizza! Thanks for the great recipe – will be trying this one with leeks we have on hand. I haven’t made pizza in the longest time, but it sounds sooooo good right about now! We stop at KAF every summer on our way to (and from) the Northeast Kingdom! A pizza stone is worth the small investment! It greatly improved our pizza. It is also what I use to bake loaves of bread. hooray for king arthur giveaway! Seriously, my kids will eat anything on pizza! This looks delicious! The cast iron skillet method is definitely my favorite way to make pizza at home! I love making pizza & for many years I used a dough recipe originally from the Silver Palate Cookbook (I think it was that one???). But in the past few years I started using a quicker dough recipe. 1 packet yeast, 3 cups water, 7 cups Italian flour, salt. Dissolve yeast in warm water (approx. 110 degrees), let sit for about 10 mins). Pour this over flour mixture and mix. Knead for about 2 mins & roll out. This makes about 3-4 small-medium size pizzas. Oven at 500. Bake around 12 minutes. Yum! Whoa that’s awesome – the “air” episode of Cooked has gotten me psyched to do some more baking. Would love to be entered in give-away! I generally prebake my crust and just for an extra little kick, I sprinkle some garlic powder on it before popping it in the oven. Always been ,always will be a big King Arthur fan. They have EVERYTHING for baking! I’m not sure how I discovered this, but burrata is the best and only cheese for making pizza. One big ball (lol) ripped up will melt and cover the whole pizza while it bakes, but it still keeps its creamy/soft texture. Also Marcella sauce makes a delicious pizza sauce and you can slice up the onion used and add some mushrooms/basil/whatever and it’s perfect!! Pizza forever! My favorite trick is for how to make a thin crust crispy without a pizza stone — bake your pizza on the floor of the oven for the first five minutes of cooking. Then move the pan up to the middle rack for the rest of the time. Thanks for the giveaway opportunity! I grew up with my grandfather baking bread and insisting on only King Arthur! Been drooling over the catalogs for as long as I can remember! I can’t wait to try WHITE whole wheat flour — maybe it will be the solution to weaning my family from processed white flour! The preferred pizza topping in our household is kale, tossed (or quickly sauteed) with olive oil and salt. It crisps up in the oven, yum! I love King Arthur products- Friday is pizza night around here! Pizza — YUM! I love smoked gouda on my pizza. Seriously? Your market already has asparagus?! I can’t wait. Here’s my pizza tip–a delicious topping combination is chopped bacon (ideally a nice thick, smoky one), caramelized onions, and ricotta. No pizza tips, but I did just make some cookies using KA flour! Oops, might be too late to enter giveaway , but wanted to say how much I adore your site. We use it all the time and are checking in today for our favorite pizza dough recipe. Living in Japan makes it almost impossible to get whole wheat flour, but the upside is we are using fresh shitake mushrooms from farmer`s market for toppings! Thanks for all the great family recipes! Thanks for the giveaway! The pizza looks amazing! Homemade pizza is awesome – I love cooking the sauce for a while on the pizza before adding the cheese and toppings. I love King Arthur products…and am very ready for spring treats like fresh asparagus…especially since it snowed here much of this day. Our first day of spring break was not very springy! Thanks for the promise of fresh green foods in this post! Spring pizza is the best! I always stick my crust in the oven naked for a minute or two, then pull it out and add the toppings. Soggy crust makes me sad. I make a large batch of simple tomato sauce and freeze it in individual portions. That, and King Arthur’s pizza dough recipe, make spur of the moment pizza easy! Best pizza I’ve been able to make at home is definitely following Deb’s recipe in The Smitten Kitchen Cookbook. Leisurely, tasty pizza dough + the shaved asparagus toppings = heaven. My favorite pizza is topped off with butternut squash and honey goat cheese. Pro tip: roast two butternut squashes instead of roasting just one. There is a never ending list of things you add butternut to (worse comes to worse you freeze it); pasta, frittata, strata, stuffing, sandwiches, and of course PIZZA! Love King Arthur! And I also love pizza… especially with spears or shavings of asparagus. Pizza night is always a great time for the family. We come up with all kinds of ideas for toppings. I usually do most of the cooking in our house, but my husband’s got the gift when it comes to pizza. This would be a fun one to win! And the pizza looks delicious! I usually par bake pizza crusts before topping (about 5 minutes), then I freeze one crust and use the other. Making a pizza is my fastest go-to supper if there’s a frozen pizza crust ready to go. Thanks! The mint in my herb garden is taking over the world and I’ve been wanting more savory recipes to take advantage of it. We celebrate Pizza Party Friday in our house! When I make homemade sauce in a Sunday, I will freeze the leftover sauce in the small snack sized ziplock bags. It defrosts in 2 minutes and is the perfect amount for a pizza! Pizza tip: we have pizza / movie nite every Friday so to speed things along, I par bake pizza dough on preheated pizza stone for 1 1/2 minutes and cool pizza doughs on a rack until we are ready to add the toppings. Now pizza only takes 7-8 minutes. Add toppings just before it’s cooked and crust stays crispy. This is an awesome giveaway! I love making homemade pizza and have always wanted to experiment with white whole wheat flour! I love pizza! It is one of the first things my daughter and I started cooking together. TIP: If your child helps, they’re more likely to eat! Putting this pizza on this week’s meal calendar. Love the addition of leeks! I love homemade pizza, we do it at least once a week. I always use King Arthur Flour to make my dough, normally Bread Flour with a small amount of White Whole Wheat for flavor. I prefer the dough to “hang out” in the refrigerator for 72 hours to develop flavor and texture. I’m not one for the traditional, I look at a pizza skin as a blank canvas and toppings as the paint. Creativity is what makes homemade pizza unique and down right fun! I enjoy searching the web, especially Pinterest, for inspiration and sometimes duplicate a recipe with my own little twist. A pie I’ve been loving lately starts with a thin layer of olive oil, caramelized onions, thinly sliced Bosc Pears, candied pecans, chopped Medjool dates, brie, arugula and topped off with smoked cheddar cheese. My tip: remove the battery from the fire alarm when making pizza. Because the oven is so hot and probably long overdue to be cleaned, I always seem to set off the alarm when making pizza. Never mind; we’re always rewarded with great pizza pie. I’ve tried your salad pizza, the sausage and ricotta, and arugula ones, all if which are delicious! For us, it’s pizza on the BBQ! So delicious! The first asparagus of spring are truly one of the great days in life! Definitely worthy of celebration. Would love a pizza stone. Looks like a great recipe! hoping your first deadline is the correct one! I’d love to win. Would you believe it if I said I’ve never made pizza dough for pizza? *face palm. * I’ve made a great dough recipe for pepperoni rolls and stromboli, though! We have home made pizza every Sunday nite. I am always looking for new ideas. I love making homemade pizza!!! It’s one of the few things I remember making at home with my parents. My best tip is to press the pizza dough out with your hands, as you’ve described. I used to use a rolling pin, but since switching to the hand method, my pizza crust is so much crisper, lighter, and fluffier. So good! I would love to win. Thanks for the great pizza recipe. This did not work for me at all. 🙁 The yeast is good so not sure what else the problem was… I don’t think I’ve seen a recipe where you don’t start the yeast in warm water first…any suggestions?? Thanks for the giveaway! We love King Arthur products and make homemade pizza all the time with them! I don’t know if this is a tip, but for some strange reason the pizza tastes better when we make it in the shape of circle rather than a rectangle. Yum! 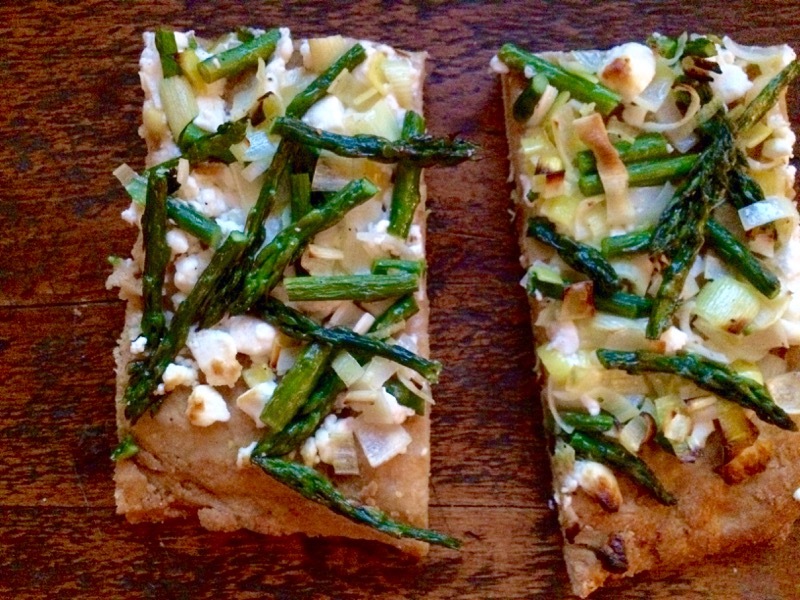 I’ve made an asparagus pizza where you use a peeler to create ribbons of the stalks. So good! Can’t wait for spring to get to NH! What a cool giveaway! Coincidentally, we did a very similar pizza last night that was a real winner: garlic, caramelized onions, bacon, asparagus, sun-dried tomatoes, and goat cheese. Pizza is the best! I love making pizza at home even though I have issues rolling out the dough every time! I figure one time it will click on how to do it. Cracked black and red pepper flakes on all pizzas. Thanks for another giveaway contest and idea! Is there any other flour? Tip: No reason that I can see not to add a poached egg to that pizza! Tip: No reason that I can see not to add poached egg to that pizza! We like to crumble dried basil on top of our margarita pizza in the winter….it’s still delicious even when fresh basil costs too much. And I agree with preheating the stone for an hour! This is a great giveaway! We love making pizza at home and like use to fresh mozzarella. I LOVE King Arthur Flour! And I am SO interested in starting to bake with whole grains & heartier flours, so this is tailor-made for me. I have an onion lover in the house, and so I pass on this tip to those trying to crack the perfect onion pizza at home: sweat the onions for a minute in a pan on the stove or for a couple of bursts in the microwave before putting them on the pizza, just enough to take the hard edge off them, and they’ll be perfect in the normal thin-crust baking time. Or even when reheating take-out pizza for four-five minutes at 400°. We love King Arthur White whole wheat at our house. We’ve totally transitioned over to whole wheat and we love it in pizza. My tip let your littles help you top the pizza. My 6yo is much more likely to eat the veggies on her pizza if she helped to spread them around. We like to do pizza on the grill when the weather’s nice! Pizza looks so yummy! Love this post! Pizza night makes the whole house happy! Yum!! Love the recipe & love KAF; I bake with their products all the time! Lately I’m in charge of dinner, and I could use all the help I can get. This pizza looks like a winner. Sounds delicious I’m going to make it tonight. This is reminding me of the many months tradition we had in our house that involved taking everything that was a vegetable or cheese from our refrigerator, dropping it on pizza crust on Friday, and proclaiming it dinner. We need to start that up again. I love King Arthur and I highly recommend their sourdough crock–it is the perfect size for a sourdough starter, and it is so pretty in the fridge that you can’t help but want to add it to everything, from bread to pizza crust! King Arthur flour is my go-to, and a pizza stone has made our regular pizza nights so much better! It is King Arthur for me or nothing! That’s a great giveaway! We’ve always gone out for pizza, so I don’t have any helpful tips to offer on pizza-making but it’s definitely a skill I want to learn. I like making spinach pies using whole wheat pizza crust to take to work for a lunch that is tidy, delicious, and not bad for you. I bake them on parchment paper, on top of a hot pizza stone. I love making pizza at home. My tip/trick is to use Mark Bittman’s food processor pizza dough recipe. It is not the fanciest bread making approach, doesn’t get deep into hydration or fermentation, but it is FAST and EASY, and you can have pizza you make yourself really quickly. Sometimes you just need to get it done, and with delicious toppings from our local italian deli, Bittman’s easy recipe makes it all work for our family. King Arthur Flour is great. They did a fantastic program with my son’s middle school where they showed them how to make bread and sent them home with the key ingredients and recipe to make 2 loaves. The kids then kept one loaf for their family and donated the other loaf to a local food pantry. We just used that recipe to bake bread again this weekend. I usually just buy pizza dough, but maybe we should try making that ourselves too. You can use the same bread recipe your son learned for pizza dough. You already know how! Sunday night is pizza night at our house! I especially love making it with my 2 year old son. My tip is to cook it on a very hot grill. love DALS, King Arthur, and pizza! I love pizza! My trick is to always cook the crust a bit before I add the sauce and toppings to ensure a super crisp crust! I’d love a chance to bake with all those products and enjoy some spring produce! Love King Arthur! I started using the whole grain version when my kids were tiny, so they don’t know there is another way baked goods could look. We started making pizza on the grill last summer and we never went back to the oven – I was out there many times this winter with a pizza on the grill. One of the best ways to use up leftovers meats or veggies is for pizza topping. Also, you can make a great pizza over a campfire in a cast iron skillet! I have never won a contest, so I’m really hoping you pick me! I love using white whole wheat flour for pizza as well as baked goods. I look forward to trying this recipe! When I make pizza using my pizza stone, I put the pie on parchment before putting it on the stone, so that it doesn’t stick to the stone. My husband has been wanting a pizza stone. This is perfect! I love making homemade pizza! Its way cheaper and tastes fresher! Think dried fruit on pizza to add a little sweet and chewy goodness: sausage, squash, Swiss chard, and dried cranberries; bacon, broccoli, red onions, feta cheese, and raisins; and chickpeas, cherry tomatoes, curried sautéed onions, and dried apricots are three examples. Delicious! I love King Arthur Flour’s White Whole Wheat flour. I sub it for AP flour often. Just picked up a bunch of asparagus maybe the kids would actually eat it on a pizza. Worth a try. Yum! Love King Arthur flour. Our pizza tip: spread dough onto parchment paper – – makes it immensely easier to slide into the oven (and can remain on parchment paper directly on a pizza stone). I just bought some asparagus at the market. Now I know what I’m going to do with it. Our favorite non-red sauce pizza is pesto + potato (thinly sliced), but I’m guessing the hints of lemon on yours will make for a lovely spring dinner. I just started making my own pizza, and would LOVE the chance to use these ingredients, as now I’m winging it. My husband and I just got married in December, and cooking together has been our very favorite married activity! It’s such good built-in quality time to catch up on our days while we’re working side by side in the kitchen. We make pizza together about once a week, and we love it because it’s so customizable– we even do different toppings on each half , depending on what we have in the fridge/ what we’re each in the mood for on a given night. And we’ve been wanting to start making our own dough from scratch (instead of buying a ball of dough from the grocery store), so this is perfect! We love pizza! I like a white pizza with a lightly dressed arugula salad on top. The heat from the pizza wilts the greens just the tiniest yet perfect amount! We love potatoes on our pizza. Nothing like carbs to go with your carbs! (I am guessing you can’t mail this to Canada but… just in case.) We have pizza every Friday and I swear by Fleischmanns’ pizza yeast which lets you make a pizza in the time it takes to preheat the oven. It works for me. Great recipe! I need to get over my dough making phobia! This sounds delicious! My super picky 4 year old loves to help make her own pizza–she might go for this dough, but probably not the asparagus! My husband swears that he doesn’t like homemade pizza. But I’m bound and determined to prove him wrong. And I think that this just might be the recipe to make my case. I love, love, love the spring veggies! Pizza is the best – and an easy way to have a dinner with no complaints!! Pizza is the best family dinner ever – everyone likes it, it’s customizable, and it’s an easy way to use up leftovers. Taco meat and fixings make a taco pizza. Butter chicken, or any curry, make great pizza. Any leftover meat or veg (steak and mushrooms, chicken and brussels, bacon and bacon)… one can clean out the fridge, feed the family, avoid any whining, all in one fell swoop! I make dough in my breadmaker on the weekend and stash it in the fridge (or freezer) until needed. Bonus “tip”: I always save a small doughball and some toppings and make a small calzone for my 6 yr old to take for lunch to school the following day. Open face pizza is too messy for her lunchbox but a calzone (especially if we have marinara for dipping) is her favourite lunch ever. I’ve also been known to make dessert pizza (apple caramel is lovely, or just straight up baked dough, dipped in butter and cinnamon), with leftover dough. This is clearly the 6yo’s job, but she also loves to make the main pizza – her favourite? black olives and every cheese we can find in the fridge. I haven’t made the jump to using a pizza stone but my pizza crust desperately needs one! This is a perfect spring recipe! Pizza makes life worth living! Excited to try out this recipe. Would love to win the King Arthur prize pack. They make the best flour! Love King Arthur Flour AND pizza – esp the blog KAF blog! Substitute honey for the sugar and add 2 Tablespoons of ground flaxseeds to the flour mixture for a omega-3 boost! We make homemade pizza every Friday. My favorite trick is to drizzle balsamic glaze over just about any pizza (favorites include a shaved asparagus pizza; pesto with peaches, prosciutto and goat cheese; and, a simple heirloom tomato with fresh mozzarella and pesto pizza) My daughter’s (5) favorite trick she actually learned from her little brother (2) who didn’t subscribe to social norms when making pizza – put the pepperoni and salami under the cheese so it doesn’t get “too crispy” Her preference, not mine. I made whole wheat pizzas yesterday. I was using leftovers … a friend had bestowed upon me the remains of a roast chicken (so chicken & artichoke hearts) and we had a bit of ham left from Easter (so ham & olives) with some strange variation of pesto from the freezer that I had made last summer. No one complained (very much, anyway), and my kids were happy to take leftovers in their lunches today. My husband loves it when I try a new pizza recipe! Awesome! Pizza tip: Let cool before giving to toddler. Don’t ask. Homemade pizza dough is the best. Honestly any homemade bread is the best. My husband is really getting into making his own bread so I know he’d love this! I love making pizza and am a big fan of putting corn meal down on the slice to make the dough slip off easier. I also like making pizza in a cast iron skillet. The crust gets so crispy! Thanks for the post, will keep an eye out for the white white whole wheat flour! Pizza every Friday without fail (sometimes we make it, sometimes we order). We use the no-knead dough you featured ages ago but let it sit on the counter all day. We like it with some cornmeal on the pan for crunch. King Arthur Flour is the best! And I love pizza! I never hae made homemade pizza. I definetely would with this! I’m a fan of post-oven arugula on my pizzas! I had no idea KA offered “identity preserved” products! I also had no idea that their white whole wheat is nutritionally identical to whole wheat. Awesome! A great giveaway! I love baking bread! Ohhhh, that is very generous of them! My favorite pizza trick isn’t a trick at all, but just to focus on the best quality ingredients possible – don’t overcomplicate it! What a generous and amazing giveaway! We love making pizza. Pizza tip: making it on the grill! I love to make pizza on the grill – perfect for crisp thin crust! I make pizza about once a week, and my husband (the bread baker) keeps “threatening” to make pizza dough, but never has. This would be the perfect way to jump start that plan! Favorite pizza topping: caramelized onions! For me, nothing beats a sausage, pepperoni, mushroom pizza. Classic. And always delicious. Can’t wait to make one if I win the pizza stone. Fingers crossed! If you happen to have any pizza left over, reheat it in a skillet on top of the stove! Makes for the best crispy crust ever. What a great giveaway! Pizza was the first recipe I set out to master when moving into my first apartment. I live in DC so unless you’re getting brick oven pizza (which sadly doesn’t do well in delivery) you’re stuck with terrible chains. I love the Mark Bittman dough recipe, which I usually make with King Arthur Flour’s white whole wheat flour. It’s made all the better by fresh mozzarella and Penzey’s pizza seasoning on top! Pizza tip – cook it on the grill!! A drizzle of olive oil. Delicious! I’ve been using KA white whole wheat flour exclusively for so many years now that I’ve lost count. (Yes, for all sweet baking as well.) When my kids were in their teens, pizza was one of the few reliable dishes that could be personalized for schedules and preferences. I lost my pizza stone many years ago and have such a hankering to replace it! No tips other than to make pizza so often that it’s second nature to prepare exactly as your family and guests love it. Pizza tip – If you’re in the Bay Area, CA – Arizmendi all the way! Not whole wheat unfortunately, but it is sourdough. We love the King Arthur flour products, and especially the white whole wheat. Our favorite pizza dough recipe involves substituting a small amount of semolina flour (like 1/4 cup) for bread flour. It seems to add a little extra crispness. This flour is KNOWN in the South for the BEST biscuits! Oooo, could use a refresh of my pizza accoutrements! tip: i will often make my pizza on parchment paper so it’s easy to get in and out of oven without the mess of corn meal. My best tip for making pizza, in the oven or on the grill, is to roll and stretch it out on the counter dusted with flour. Then when it’s about the size you want, transfer to a parchment paper lined cookie sheet. Put your toppings on then trim the parchment paper close around the pizza edges. Leave just enough parchment paper so that you can grab it to help easy the pizza onto the pizza stone. I’ve lost lots of pizza toppings trying to move the pizza without the parchment paper! Love Pizza! My favorite is on the grill. Spray olive oil on the dough to prevent it from sticking to the grill! I was just on the KA site today reading tips about high altitude baking. Haven’t attempted pizza at high altitude yet. This giveaway would be the bomb for our family! Sunday nights have been pizza night in our family since my oldest daughter was 2. She is now a 21 year old junior in college, followed by an 18 year sister, also away at school. It is now only my husband, 16 year old son and I carrying on the tradition. It is a day starting with making our dough, followed by the making of a variety of pizzas according to individual tastes….black olives/pepperoni, Hawaiian style, arugula, or sausage and peppers. I recently asked my husband if he thought we would continue pizza nights in our family when it was just the two of us and he response was of course! It is a night where all phones are turned off, a movie and pizza make the evening. My family would be all over this giveaway, especially since we already use King Arthur in our house!! I’ve never made pizza dough from scratch (rely on the local Italian bakery for their premade bar shells) but may have to give it a try! Pizza -homemade with King Arthur flour- is part of pur regular dinner rotation… This recipe sounds delicious! I love King Arthur flour! I make bread with out all the time and I’m sure it makes great pizza, too! Pizza tip: when you’re bored of red sauce and pesto, use fig spread instead. Top with cheese, and any toppings you want (I like carmelized onions and kale). One of current favorite pizzas is made with sausage or salami or both, mama lils peppers and a drizzle of honey. Now I’m wishing we were having pizza for dinner! Thank Goodness for King’s Arthur flour.. I am able to bake and the kids have no idea how much healthier everything is. Friday night is pizza night at our house. Fresh mozzarella is wonderful. I love King Arthur, their Queen Guinevere and Lancelot flours also! What a perfect pairing with DALS! I love the idea of incorporating different flavors and vegetables into “pizza.” It is a great way to get kids to eat new things! Yum! Homemade pizza was the first thing I made for friends in college, where I used an empty vodka bottle as a rolling pin (not recommended). For my birthday, my two male roommates bought me a rolling pin…so I could make them pizza. 🙂 Now, my favorite pizza topping combo is prosciutto, arugula and burrata. What a great gift pack! Cheers! We love fresh mozerella, sausage and/or salami, mama ‘lils peppers, and a drizzle of honey. Best on a charcoal grill but good out of a piping hot oven too! Now I want pizza for dinner. Ooh! I love King Arthur flour! And asparagus on pizza! Count me in! My son enjoys eating Pizza. I tend to do the same one. Thanks! I will try doing this dish for my son. Oh, man! Totally making this for dinner this week. Thanks! We love making pizza with King Authur flour, it’s the best! Love KAF flour. It’s all I use. As for pizza tips, preheat your oven with the pizza stone in it. For longer than you think you should. Makes all the difference. No sticking and no soggy crust. We make pizza once a week with our 2.5yo. Her favorite toppings are chorizo and fresh pineapple! Huge King Arthur fan!!! I shape my dough into small rounds, place toppings on half of each circle, fold, and crimp to send my kids to school with delicious calzones!. Wrapped in foil, they seem to stay warm through lunch! We have homemade pizza every Friday night. I found your blog because I was googling Sal’s salad slice—my favorite from when we lived in Mamaroneck! You’ve also converted me to Don Pepino. The best! We’ve been doing homemade pizzas for a while now – but not really as I have been buying the dough from our local grocery’s bakery (comes in a ball). Good, but not great. Having read this–and all the very helpful comments! !–I finally feel ready to do it myself from scratch. So excited! Asparagus, mint, and feta — love this combo!!!! Pizza tip or trick? I am by no means qualified to give culinary hints, but I do like to move my pizza halfway through to another rack. I start on the top usually and move to the bottom. Maybe that’s because neither rack is helpfully positioned so I am trying to mitigate damage. Pizza is quite possibly my favorite food. Especially if it comes with an ice cream cone for dessert. My new favorite way to prepare it is to make mini stromboli with it. Everyone can customize it to their liking (and it’s fun for kids to participate). I cut up a pizza dough into tennis-ball-sized pieces (store bought or homemade) and stretch them out into rectangles. Then I like a couple slices of provolone and some pepperoni, and roll it up. Brush with olive oil and sprinkle with oregano and red pepper flakes, and bake on high heat (450-ish) for about 15 minutes. Dip in pizza sauce or marinara. This is so fun! I’m usually too lazy and buy store bought dough, but this is simple enough to not be intimidating. And I love the white wheat flour. Great giveaway, yummy looking pizza. We love pizza at our house because it is so naturally customizable for all the different food sensitivities/preferences that exist in our family. Everyone can have what they want without it feeling like I’m a short order cook! I use their flour all the time – makes great baked goods, especially bread. I love King Arthur flour, been using their WWW and their Bread Flour for a couple years now and am always impressed with its quality. This pizza looks FAB! We love pizza but I’ve always been a little intimidated about making crust myself, especially after a couple disastrous attempts. I’ll have to try your recipe next. I love pizza, I love feta, and I love asparagus. It’s the best of all possible worlds. Thanks for the giveaway and the recipe! My husband and I love hosting pizza night at our house as it’s a great interactive dinner! We specialize in thin crust Italian style pizzas with lots of unique and yummy toppings! Love King Arthur and making pizza with the kids. Thanks for the post and the giveaway! Looks delicious! Thanks for the opportunity to win! KA flour is the best for crust though I haven’t tried with the white whole wheat yet. We always parbake our crusts before toping to ensure crispy bottoms. Our other favorite trick is to freeze parbaked crusts. They are ready to be topped and put in the over for very quick lunches or dinners. This looks like spring on a plate! Love it. I would LOVE this! Everything kitchen speaks to me! I love the King Arthur White Whole Wheat Flour. It makes me feel like I am feeding my kids something vaguely healthy when I bake their favorite treats. We love homemade pizza, a pizza stone would be awesome! My toddler loves broccoli on her pizza. It’s fun to introduce her to new things by trying out new toppings. I love to mix up some pizza dough on Sunday or Monday night, then use it for whatever hurried weeknight meal works best! Arrive home, get the dough out of the fridge, let it warm up while kids finish homework, then stretch, top, and bake as a reward for kids being done. Have a cocktail while the oven warms to 550. Pizza! Our go to favorite is quatro fromaggi with spicy salami and topped with arugula. So delicious!! I love King Arthur! We used to have a pizza stone, but when we remodeled our last kitchen my husband gave it away with the oven we sold on craigslist. Would love to have one again. Thanks for the giveaway! What a nice spring time treat — though, I tend to be shy about making pizza dough –it seems a bit more than I can deal with some days. I bet the topping would be awesome on pasta or as a filling for a frittata, hmm.